Report by Major Tunbridge about Elands River, 15 September 1900, page 3. 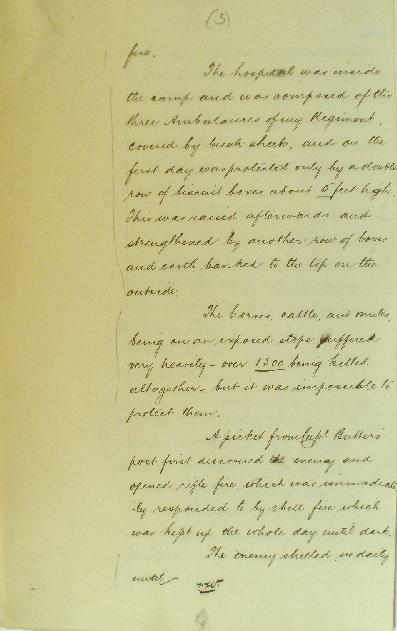 On 15 September 1900, Major Tunbridge wrote a report of the action at Elands River for the NSW General Staff of which page 3 is transcribed below. The hospital was inside the camp and was composed of the three Ambulances of my Regiment covered by buck sheets, and on the first day was protected only by a double row of biscuit boxes about 5 feet high. This was raised afterwards and strengthened by another row of boxes and earth banked to the top on the outside. The horses, cattle, and mules, being on an exposed slope suffered very heavily - over 1500 being killed altogether - but it was impossible to protect them.